Though Ralph Breaks The Internet won’t make its theatrical debut until around Thanksgiving—just in time for all those arguments about what movie every single person in your family can enjoy seeing at once—early critical screenings have already revealed a dork-friendly deep cut Easter Egg. Eagle-eyed viewers who are also Comedy Bang! Bang! listeners should be on the lookout for a character in the movie played by Jason Mantzoukas, who CBB fans know as regular guest on the podcast. In the film, he pops up as a “well, actually” style internet commenter who’s throwing around dickish nerdery in an Oh My Disney Q&A we can’t really tell you much more about without spoiling some of the fun. Though he only has a few lines in the movie, Mantzoukas’ character does have an actual name in the credits: It’s “Hey Nongman,” which CBB listeners will recognize as the show’s biggest quasi-secret handshake phrase, one that’s been embraced by everyone from CBB host Scott Aukerman to CBB superfan Lin-Manuel Miranda. The podcasting Easter Egg is one of literally hundreds of in-jokes buried within the movie, which should reward repeat viewings. 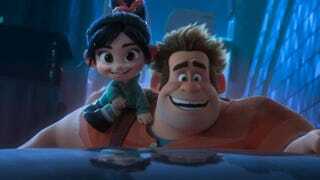 Ralph Breaks The Internet opens in theaters November 21.